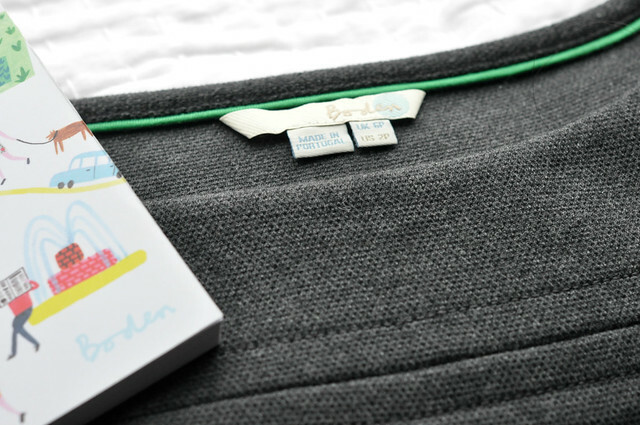 Today, I want to share my thoughts on a clothing brand that is relatively new to me - Boden. According to Wikipedia, Boden was founded by Johnnie Boden in 1991 and initially launched with eight menswear products. In 2002, the company expanded to America. The London-based label has introduced their petite collection in late 2012. With a modern touch on classic styles, Boden offers quality apparel, shoes and accessories for men, women and children. I originally asked for this chic tweed shift dress but the color I wanted is sold out in my size. I then settled for the Libby dress. I am so glad I did because it's one of the best fitting dresses I own and that says a lot about this dress. For reference, I am 5'2" and not short-waisted by any means. I was afraid the waistband would not hit me at my natural waist. I am so relieved that it does. I have seen nothing but rave reviews about this dress and it certainly didn't disappoint. Measurements of a size UK6P (US2P) are: Shoulder to shoulder = 12.5", across the waist = 12", sleeve length = 13.5", overall length = 31". I simply adore the fit and flare cut. It usually works well with my figure. The construction and craftsmanship of this dress are truly exceptional. The fabric is thicker than I expected (in a good way). It feels very sturdy and has substantial weight to it. To dress up this rather plain dress, I went with gold accessories for a festive look. This look is perfect for any holiday party. When the holiday season is over, it works for the office as well. All in all, it's a polished little dress that I don't see going out of style anytime soon. Boden is giving away a $25 gift card to spend on BodenUSA.com. All you have to do is visit their site, leave me a comment and let me know your favorite item(s). I will announce the winner next Sunday. Unfortunately, this giveaway is open to US readers only. Good luck! That tweed shift dress is great...I love the pockets. That is what I'd buy. Also, you have some great root lift in your hair. How'd you do that? Such a lovely dress, I'm glad too you didn't get the other one cause this one is adorbs! Nothing like a red over coat for winter, lovely outfit! I have my eye on the Weekender dress--casual but chic. It has over 100 reviews and mostly positive. I love boden stuff. I have gotten a couple of their kids items (very cute) before but did wait for their sale as they are more pricey than the brands here. The quality is great and it's worth it though. That dress looks like it fits you perfectly, I love it! Great dress choice and I love how you festivized (I guess that's not a word...you know what I mean though) it with the fun, sparkly, statement necklace. So glad to have you in the Holiday Link Up again! Beautiful dress - I love how you glammed it up with the necklace & belt. I used to live in England and Boden was always very popular with the "yummy mummy" set, so it's no surprise that their clothes are such high quality! Even though I'm petite, petite clothes never ever fit me right! This dress is perfect on you and the belt is exactly what it needed to make it holiday appropriate! Beautiful! Thank you for sharing with the linkup! I'm not sure if it's intentional or not, but I'm trying to pin you to our Holiday Style board on pinterest, but it's not letting me. Just didn't want you to think I was purposely not pinning your look! Great choice on the dress! It's exactly my style and definitely an item I would wear. Ever since I heard that Boden is comparable to Banana Republic, I've coveted Boden but the $10 shipping and $7 returns have dissuaded me from buying. I like their Sparkle Knitted Jacket and Barcelona Cardigan. I'm a big fan of Boden in the UK. They have a great petite range. It's great to see that they've made it over the pond! The dress looks fabulous on you, Sydney!! Thank you for the heads up. I'm really impressed with the statement, that petite sizing isn't about just hiking up the hem, but the clothing is proportionately shortened. I'm loving the Bistro Pant (#WM352) in the teal jacquard for going to out to dinner, without donning a dress, or the Peter Pan Collar Dress (#WH559) for trekking around the city in the snow (our first time in NYC!). ^^Sydney, that was me. For some reason, my Google account is posting me as unknown (???). @Carylee I forgot to change the photo permission. You should be able to pin them now. Thanks for letting me know. I like the black equestrian boot! Super fun look! I am in love with your coat and gloves; perfect topping to a cute outfit! Thanks for doing this review Sydney! I always get boden catalogs in the mail but never made an order since I don't know anything about them. I like the Jewelled Tunic Dress on their website. You look beautiful in this dress and I love the coat! I love the wrap Jersey top. Ooh...i love the belt and jewelry...I hope the gold belt trend stays for a while, because it's so cute! Love everything about how you styled the dress! The dress fits you like a glove! I love the colette dress! I love the Heritage Coat. Thanks! I love the Sixties Sweater! I actually really like the Libby Dress. I've been looking for a thick knit, similar gray dress for a while that I can wear with over-the-knee boots and yours looks so great on you! This is elegance at its best! I love the red coat too, so chic! Super cute! I'd get something for my little girl. She would LOVE the birds on the printed tea dress from the Mini Boden line. Love the Libby dress! Also their clutches look snazzy. I am always looking for great office pieces- I really think the Libby dress is my fave but the Wool Tulip Dress is a close second!